MUNICH (Reuters) - The leaders of Russia, Ukraine, Germany and France agreed to meet in Belarus on Wednesday to try to broker a peace deal for Ukraine amid escalating violence there and signs of cracks in the transatlantic consensus on confronting Vladimir Putin. The four leaders held a call on Sunday, two days after Chancellor Angela Merkel and French President Francois Hollande traveled to Moscow for talks with Putin that produced no breakthrough in the nearly year-long conflict that has claimed over 5,000 lives. After the call, Ukraine President Petro Poroshenko said progress had been made and that he was hopeful the meeting in Minsk would lead to a "swift and unconditional ceasefire" in eastern Ukraine, where pro-Russian separatists have stepped up a military offensive in recent weeks, seizing new territory. But Putin warned in a newspaper interview that Kiev must stop its military operation in east Ukraine and stop exerting economic pressure on rebel-held regions. "Kiev's attempts to exert economic pressure on Donbas (region of east Ukraine) and disrupt its daily life only aggravates the situation. This is a dead-end track, fraught with a big catastrophe," Putin told Egyptian state newspaper Al-Ahram, according to an English transcript provided by the Kremlin. 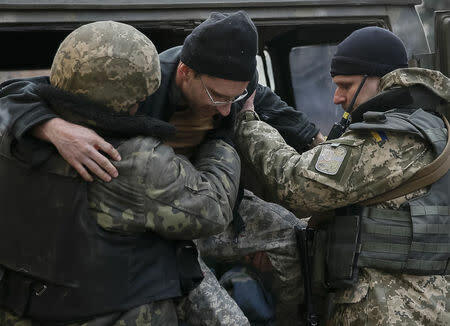 A Ukraine military spokesman said on Sunday that intense fighting was continuing around the rail junction town of Debaltseve, with rebel fighters making repeated attempts to storm lines defended by government troops. At a high-level security conference in Munich over the weekend, Merkel said it was uncertain whether further negotiations would lead to a deal with Putin but argued that all opportunities for a diplomatic solution should be pursued. She came under sharp criticism from U.S. Senators Lyndsey Graham and John McCain, both Republican hawks, for opposing the sending of defensive weapons to the Ukraine army to help it fight the separatists. "The Ukrainians are being slaughtered and we're sending them blankets and meals," McCain said in Munich. "Blankets don't do well against Russian tanks." U.S. Secretary of State John Kerry sought to play down the differences with Europe. "Will we remain united? The answer is absolutely, positively, unequivocally we are united, we will remain united," Kerry told the conference on Sunday, describing any differences as tactical rather than strategic. Members of the Obama administration are also believed to be skeptical about arming Ukraine but the president faces intense pressure from a Republican-led Congress to act. 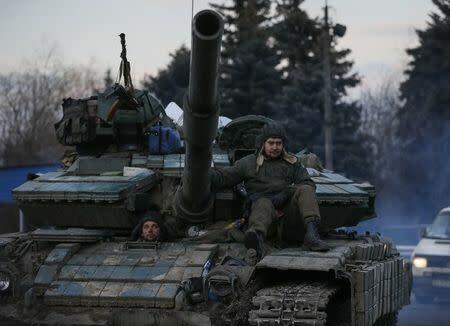 The Germans believe sending weapons to a depleted Ukraine army would not improve its chances against separatists armed with "unlimited" supplies of Russian military equipment. They also fear that delivering arms would internationalize the conflict, playing into the hands of Putin, who has painted the crisis as a Western plot to weaken Russia. The secretary-general of the Organisation for Security and Cooperation in Europe told Reuters in an interview he was worried direct Western military support for the Ukraine government would fan the flames of the conflict. "It may even lead down the line to more direct intervention of Russia in this conflict," Lamberto Zannier said at the Munich Security Conference. Merkel, 60, flew to Washington on Sunday for talks with Obama. A Russian speaker who grew up behind the Iron Curtain in East Germany, she has taken the lead in pursuing a diplomatic solution to the conflict, speaking with Putin by phone dozens of times over the past year and meeting with him in Moscow, Sydney and Milan in recent months. But German officials say Putin has shown little appetite for compromise and they acknowledge in private that he has repeatedly broken promises in the past. One senior official, speaking on condition of anonymity, said the Russian leader might have little incentive to clinch a peace deal now, while pro-Russian rebels are making gains on the ground in eastern Ukraine. "He can sit back and wait as the pressure steadily builds on Ukraine and its leaders," the official said. Russian Foreign Minister Sergei Lavrov, who in Munich, accused the West of turning a blind eye to ethnic cleansing by Kiev-backed militias, said on Sunday that he expected the Minsk meeting to yield "important decisions". But German and French officials were more circumspect, and Putin said on Sunday after the call with Merkel, Hollande and Poroshenko that the Minsk meeting could only happen on Wednesday "if by then we have managed to agree our positions." Sources told Reuters that Putin had forwarded a nine-page peace proposal to Merkel and Hollande last week before their visit which included a series of unacceptable demands, including the pullback of all Ukrainian weapons to new lines within the country. Poroshenko made clear in Munich that any peace deal must be on the basis of a previous agreement clinched in Minsk last September. Since that deal however, the separatists have seized large swathes of Ukrainian land, raising doubts about whether they will ever agree to pull back to the lines enshrined in the old pact. 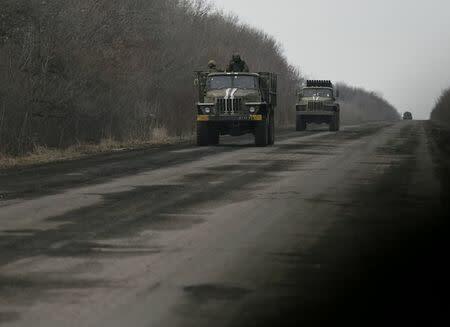 These so-called "demarcation lines", the sealing of the international border and the withdrawal of heavy weaponry are at the heart of the negotiations with Putin. If there is no breakthrough on Wednesday, European Union leaders meeting in Brussels the following day may signal their readiness to ratchet up sanctions against Russia, including targeting new sectors of the economy, like the banking sector. In the meantime, EU foreign ministers meet in Brussels on Monday, when they are expected to endorse an expansion of visa bans and asset freezes to 19 more people, including a Russian deputy defense minister. Officials say a final decision on tougher sanctions is not expected before the next summit of EU leaders in March. Describing Putin as a "tyrant", British Foreign Secretary Philip Hammond told Sky News that the Minsk talks were a last opportunity for the Russian leader to avert crippling new sanctions that would cause "significant damage" to the Russian economy.